Millions of Venezuelan families have been torn apart by the ongoing crisis in their country and live apart, not knowing if they will see each other again. As the troubled state runs out of medicine, food and money, those who can afford to leave, but not everyone can go. More than three million Venezuelans who have fled the country – some with just the clothes on their backs and a small rucksack. Thousands pass through the borders to Colombia and Brazil in buses and on foot every day, joining the exodus of desperate people looking for a new life in other Latin American states such as Panama, Ecuador, Peru and Chile. Others, who have more money, have taken planes to the Argentina, Mexico and the USA and Caribbean states in huge numbers. There are now some 200,000 Venezuelans living in Miami alone while thousands more have made the longer journey to countries such as the UK. Among them is Adriana Mendoza, who lives in the UK with her husband and three children, while her parents live in Mexico and her grandmother remains in Caracas. The 38-year-old always intended to return home but is terrified that it is not safe for her children or her mother, who can no longer find medicines she needs for her Type 1 diabetes. 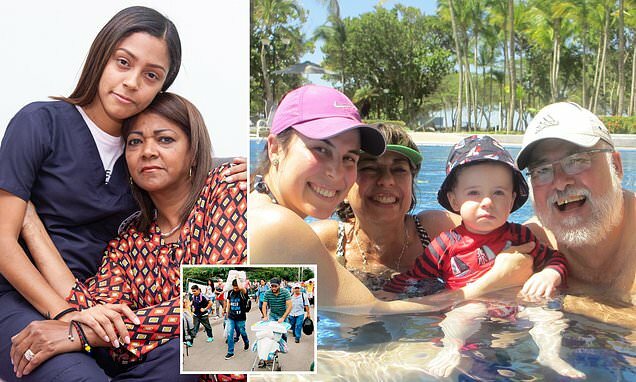 'I grew up in a typical Venezuelan family,' she told MailOnline. 'We all lived in Caracas and that's where we would, most probably, live our whole lives. 'There was never an intention to immigrate, we lived in paradise. Weekends would be spent in family BBQs at my grandparents' or sleep overs at my cousins.